Established in 2013, Brick Brewery operates from a railway arch in Peckham Rye. As well as brewing beers in a range of different styles, with recipes inspired by the brewing team’s travels, each built from scratch, the team also built their own Tapyard with indoor and outdoor seating, plus 20 taps showcasing the brewery’s entire range. Here, lagers are inspired by the Czech Republic; IPAs and Pale Ales by North America and Porters and Bitter from the UK. Imperial Stouts, DIPAs and an exciting selection of sour beers are also produced. While the ingredients differ for each beer by Brick Brewery, the process remains fairly static. Malted barley is mashed then sparged, the wort is boiled, with hops added for flavour and aroma, then chilled to differing temperatures for lagers and ales before yeast is added. 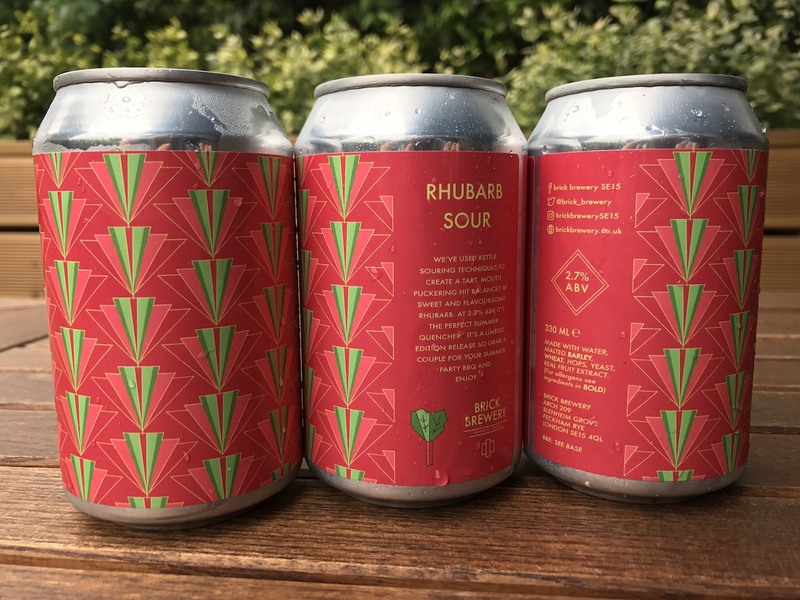 A limited released from the brewery, Rhubarb Sour is ensnared in a can with a striking design by Illustrator and Graphic Designer Iris Loi. A kettle souring technique is used to produce a beer with a relatively low ABV (2.7 per cent). Brick Brewery Rhubarb Sour is hazy yellow on pour, capped with a white head. Aromas of rhubarb are expectedly omnipotent on the nose, backed with some slight barnyard funkiness, grapefruit, lemon zest and yellow plum against a feint herbal backdrop. Distinct rhubarb notes continue on the palate with some pithy grapefruit, mild bitterness and a whisper of salt. Light bodied with spritzy carbonation, the beer’s finish is remarkably clean: tart, refreshing and rampant with lingering sour fruit. An enjoyable low ABV brew, a must-try for sour beer enthusiasts and an easy-drinking beer ideal for spring. Further information on Brick Brewery can be found here.